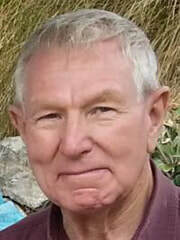 Max was born in Blenheim in 1944. His family encouraged creativity and he learned to play the piano as a child as well as being encouraged to try various artistic pursuits. He joined the Bank of New Zealand on leaving school and after having been transferred to Wellington bought a potter’s wheel in association with a childhood friend. He describes pottery as useful, beautiful and durable and derives great satisfaction from seeing his pieces in daily use. Max is never happier than when working with groups of people towards a common objective. “If they are laughing, they are learning,” he says. He would like his epitaph to read “Max made work fun”. In 1999 he returned to Blenheim to develop an olive grove and vineyard on a property he and his wife Pat had purchased in the Waihopai Valley. The change of location and circumstances led to his interest in painting finding an outlet for expression with pastels. In 2014 he moved into town and has devoted more time to sketching and has taken up watercolour painting. Throughout his working career, he was active in arts administration and leadership. He was the convenor of the PANZ Conference which was held in Blenheim in 2012. “I like pastels, they are exciting, forgiving and ever fresh. It is good to extend my range and develop techniques. We are born to communicate and I derive meaning and purpose from connecting with people and conveying ideas”.